Being British, it is culturally compulsory that I have an opinion of the weather. And I do. Like most I automatically celebrated the sun and grumbled when it rained or snowed, it never occurred to me to query the logic behind my belief. Recently as part of reevaluating my life I have been seriously assessing my thoughts and ideas. Looking at where they come from and noticing whether they are serving to create the kind of life I desire. This may seem like a tiresome and never ending task and yes it is never ending but it is definitely not tiresome. Now that I fully understand the power words and beliefs have in my life I am grateful that I have that knowledge and more than happy to do it. It has become like a game to me. As each useless, ignorant idea is identified and released my life gets better. I needed to understand why I had accepted that certain weather should be considered 'bad' or ' horrible'? Who had convinced me of this? Some conditions will feel uncomfortable. I could be cold, wet or even breathless and that is not considered good. This thought continues to exist and mainly because it is accepted without thought. Yet it is in those circumstances that we learn how to survive, see how strong we are and fully appreciate the spectrum of Nature, whose habitat we have invaded not the other way around. 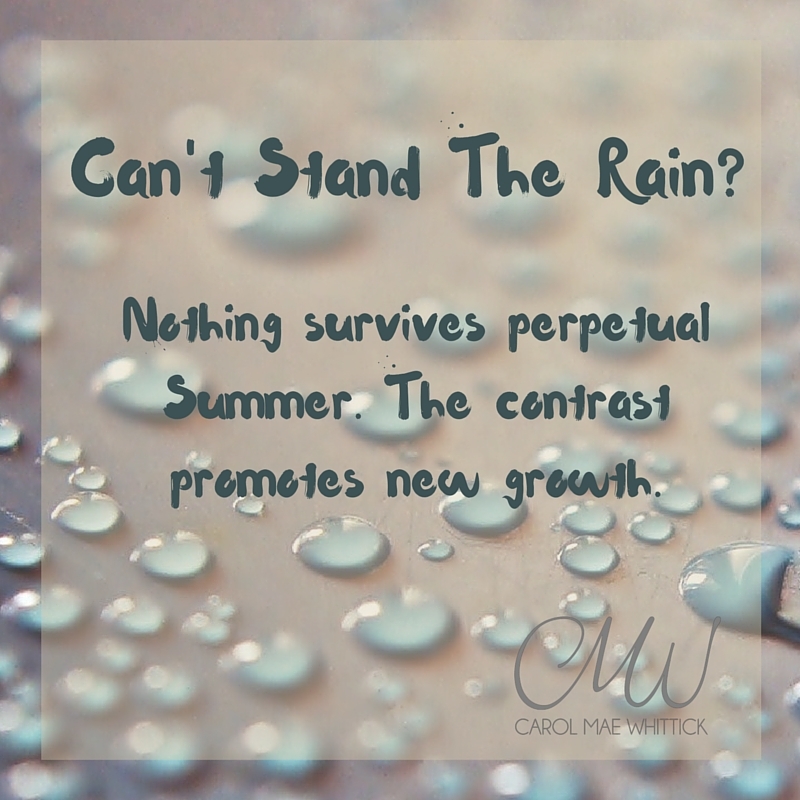 Wishing the rainy days away turns the attention and appreciation away from the miraculous environment we inhabit.